DIAD: Emerge! 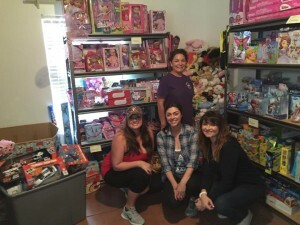 Holiday House | Junior League of Tucson, Inc.
Emerge! Center Against Domestic Abuse in Tucson provides domestic abuse crisis intervention and housing, prevention, education, support, and advocacy services to anyone experiencing domestic abuse. While the majority of the people seeking their services are women and children, their services are available to anyone regardless of gender. Emerge! provides support in so many ways one of which being hosting a Holiday House where families can “shop” for gifts for their family members at no cost to them. When the families at Emerge! open the gifts from the Holiday House drive, they are unwrapping more than just tangible items. They are also receiving hope and joy, which is often hard to come by for victims and survivors of domestic abuse. In a safe and familiar environment, Emerge! participants who are working to piece their lives back together are given the opportunity to “shop” for gifts for their family members at no cost to them. Our League members had the opportunity to set up the store for the participants of Emerge! to shop around in. The women of the Junior League of Tucson support non-profits in Tucson that impact members of our community directly. By being a member of the Junior League, we are able to reach out and show prime examples of women supporting women! Working with Emerge! is a fantastic opportunity for the women of our league to do a little thing that can make a huge difference in someone’s life.